Conservatives keep up the pressure to have the PM's security adviser testify. Public Safety Minister Ralph Goodale stands during question period in the House of Commons on March 29, 2018. A week of heated debate over a government official's briefing to the media ended with federal Conservatives accusing the Liberal government of "muzzling journalists." Tory MP Mark Strahl made the charge in question period Thursday while pressing Public Safety Minister Ralph Goodale on the Liberals' refusal to let Daniel Jean testify at committee on the Jaspal Atwal affair. Jean, who serves as Prime Minister Justin Trudeau''s national security adviser, gave a briefing to reporters covering Trudeau's trip to India last month. He suggested factions in the Indian government may have had a hand in Atwal, a failed assassin, landing an invite to attend an official event. Strahl reiterated in the House of Commons that Tories want Jean to give the same briefing to members of Parliament that he gave to the media. Liberals have instead offered Tory Leader Andrew Scheer a full, classified briefing on the matter and have criticized him for not taking them up on it. The Tory MP accused Goodale of gagging not only Jean but the members of the media with which he spoke in India, "preventing them from reporting on what they heard in the unclassified briefing." 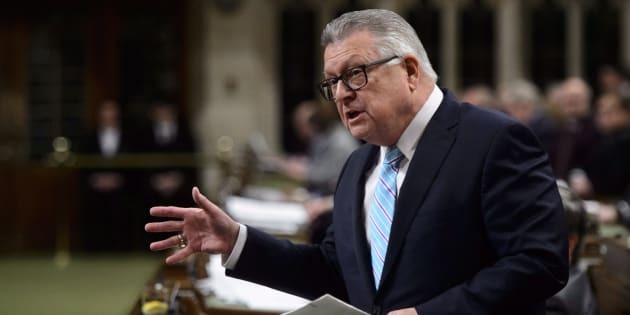 Goodale shot back that only the Conservatives would consider the offer of a full briefing of classified and unclassified information as muzzling. The veteran minister also alluded to the all-night, marathon voting session Tories sparked last week as retribution for the Liberals' position on Jean's potential testimony. Tories tabled hundreds of motions related to billions in interim funding for government departments and agencies. The effect of the protest, however, was that Tory MPs voted against money going to various departments. And in some cases, the optics may not be politically appealing. "They are tying themselves into some strange knots because they forced themselves last Friday to vote against some very good things that Canadians want," Goodale said. "Like, for example Mr. Speaker, the funding for injured members of the RCMP. They voted against that, Mr. Speaker. And they voted against benefits for veterans." A little earlier, Goodale responded to a question from Tory MP Michelle Rempel by noting that Tories "voted against the settlement of Yazidi women and girls in Canada." Rempel successfully sponsored a motion in 2016 that pushed the Liberal government to provide safe haven for Yazidi women and girls facing persecution in Iraq. Strahl called it a "sad spectacle" to see Goodale — an MP for more than 25 years — "reduced to reading talk points from the prime minister's office." Goodale again shot back that Scheer should accept a private briefing to get the truth and "not some silly innuendo that they've dreamed up for themselves." Recently, Tories have been highlighting a tweet from Global News' David Akin in which the journalist noted that, at different points in his briefing with a "senior government official" in India, he learned things he was told he couldn't print. Deputy Tory Leader Lisa Raitt even referenced the tweet in question period Tuesday, mere minutes after it was sent. I had one of those briefings from the "senior government official". At several points in our not-for-attribution briefing, the official told me stuff he said I couldn't print. How would I know if that was unclassified or classified? Trudeau suggested in question period Tuesday that Conservative accusations of secrecy and a "cover-up" were rich. "Only Stephen Harper's Conservative Party would think that giving information to the media is somehow hiding information from Canadians," Trudeau said.